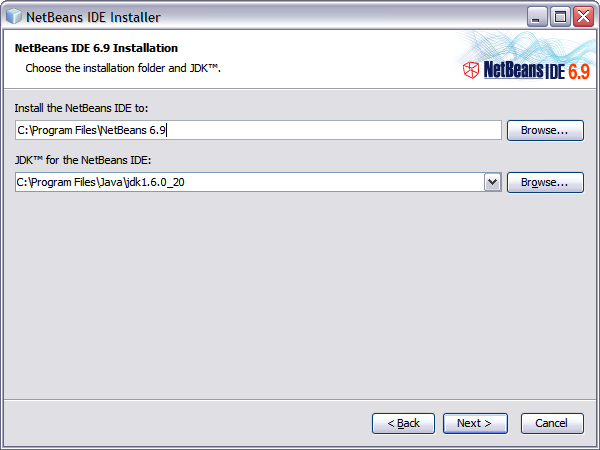 We are going to start out carefully with the steps needed to set up your Netbeans IDE. This workbook is also available for Eclipse or Maven command line use. The build tool Maven (http://maven.apache.org/) is our preferred option for downloading and managing jars. GeoTools projects tend to use a large number of jars and an automated solution is preferable. If you are already familiar with Maven that is an advantage but if not, don’t worry, we will be explaining things step by step and we will also document how to set up things by hand as an alternative to using Maven. These are visual tutorials that allows you to see what you are working with while you learn. These examples make use of Swing; be assured that this is only to make the examples easy and fun to use. These sessions are applicable to both server side and client side development. We would like thank members of the GeoTools users list for their feedback while were preparing the course material, with special thanks to Tom Williamson for reviewing early drafts. We are going to be making use of Java so if you don’t have a Java Development Kit installed now is the time to do so. Even if you have Java installed already check out the optional Java Advanced Imaging and Java Image IO section – both of these libraries are used by GeoTools. 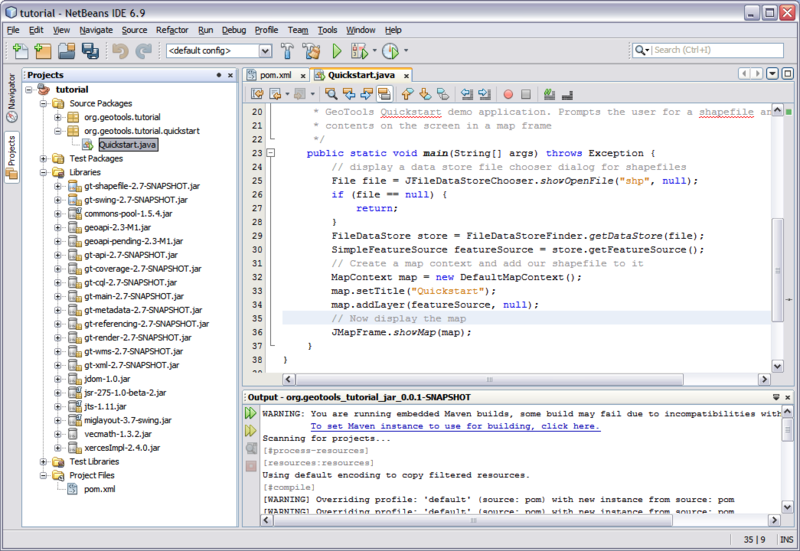 The NetBeans IDE is a popular choice for Java development and features excellent Maven integration. Download NetBeans (The Java SE download will be fine). At the time of netbeans-7.0.1-ml-javase-windows.exe was the latest installer. Click through the steps of the installer. You will notice it will pick up on the JDK you installed earlier. 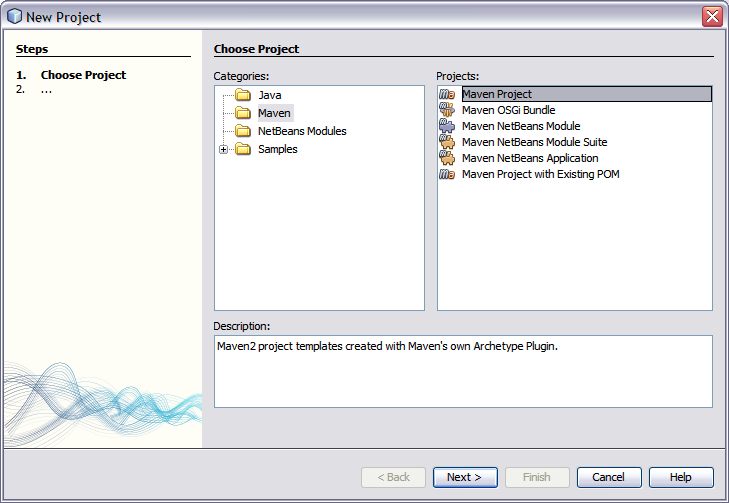 The GeoTools development community uses the build tool Maven which is integrated into the latest releases of NetBeans. Although Maven is a build tool it works by describing the contents of a project. This is a different approach then used by the Make or Ant tools which list the steps required to build. The description of a project inlcudes the required jars (called dependencies) and a repositor on the internet where the jars can be downloaded. We will be using these facilities to bring GeoTools jars into our project as needed. Select the Maven category; choose Maven Project and press Next. 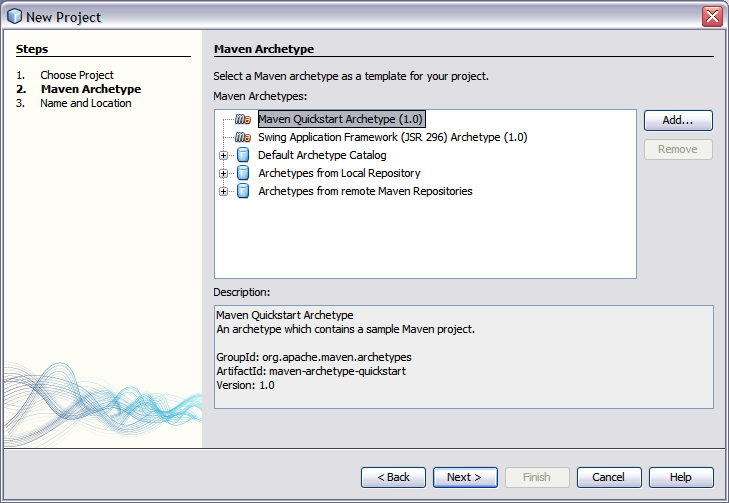 On the Maven Archetype page select “Maven Quickstart Archetype” and press Next. Click on the Finish button and the new project will be created. If this is your first time using Maven with NetBeans it will want to confirm that it is okay to use the copy of Maven included with NetBeans (it is also possible to use an external Maven executable from within Netbeans which is convenient if, for instance, you want to work with the same version of Maven within the IDE and from the command line). Your local maven repository has already been populated with geotools allowing the use of “offline” mode. When downloading jars maven makes use of a “local repository” to store jars. When downloading jars maven makes use of public maven repositories on the internet where projects such as GeoTools publish their work. In the Projects panel open up the Project Files folder and double click on pom.xml to open it. We are going to start by defining the version number of GeoTools we wish to use. This workbook was written for 22-SNAPSHOT although you may wish to try a different version. To make use of a nightly build set the geotools.version property to 22-SNAPSHOT . If you make any mistakes when editing the xml file you’ll see that your project will be renamed “<Badly formed Maven project>” in the Projects window. You can choose “Format” as a quick way to check if the tags line up. Or just hit undo and try again. Next we add two GeoTools modules to the dependencies section: gt-shapefile and gt-swing. You can now right click on Libraries in the Projects window, then Download missing Dependencies from the pop-up menu. When downloading it will check the repositories we have listed above. We will continue to add dependencies on different parts of the GeoTools library as we work through these exercises; this fine grain control and the ability to download exactly what is needed is one of the advantages of using Maven. You may find cutting and pasting from the documentation to be easier then typing. Now that your environment is setup we can put together a simple Quickstart. This example will display a shapefile on screen. 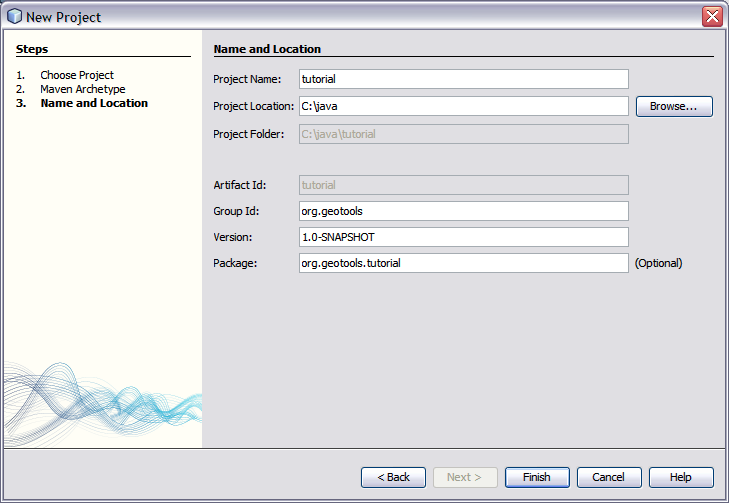 Create the org.geotools.tutorial.quickstart.Quickstart class using your IDE. * Prompts the user for a shapefile and displays the contents on the screen in a map frame. Build the application and check that all is well in the Output window. A fair bit of time will be spent downloading the libraries required. We need to download some sample data to work with. The http://www.naturalearthdata.com/ project is a great project supported by the North American Cartographic Information Society. Head to the link below and download some cultural vectors. You can use the ‘Download all 50m cultural themes’ at top. Please unzip the above data into a location you can find easily such as the desktop. Run the application to open a file chooser. 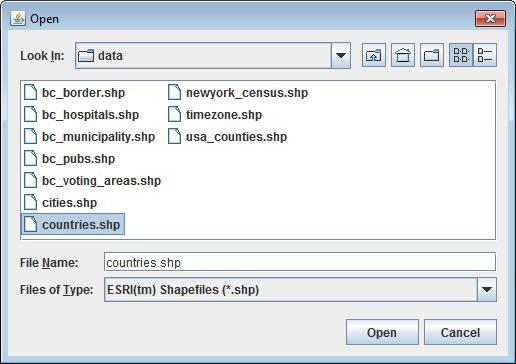 Choose a shapefile from the example dataset. The application will connect to your shapefile, 1.produce a map context and display the shapefile. The shapefile is not loaded into memory – instead it is read from disk each and every time it is needed This approach allows you to work with data sets larger then available memory. We are using a very basic display style here that just shows feature outlines. In the examples that follow we will see how to specify more sophisticated styles. Each tutorial consists of very detailed steps followed by a series of extra questions. If you get stuck at any point please ask your instructor; or sign up to the geotools-users email list. 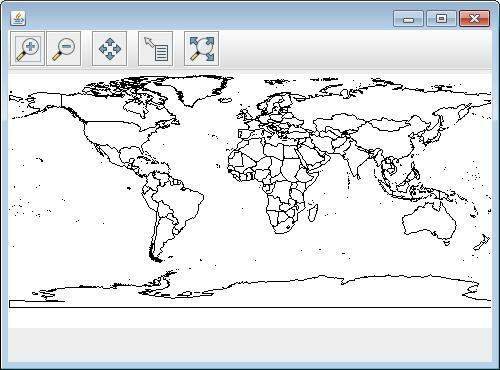 Download the largest shapefile you can find and see how quickly it can be rendered. You should find that the very first time it will take a while as a spatial index is generated. After that performance should be very good when zoomed in. Fast: We know that one of the ways people select a spatial library is based on speed. By design GeoTools does not load the above shapefile into memory (instead it streams it off of disk each time it is drawn using a spatial index to only bring the content required for display). * zooming in and out). When building you may see a message that CachingFeatureSource is deprecated. It’s ok to ignore it, it’s just a warning. The class is still under test but usable. Try and sort out what all the different “side car” files are – and what they are for. The sample data set includes “shp”, “dbf” and “shx”. How many other side car files are there? Advanced: The use of FileDataStoreFinder allows us to work easily with files. The other way to do things is with a map of connection parameters. This techniques gives us a little more control over how we work with a shapefile and also allows us to connect to databases and web feature servers. 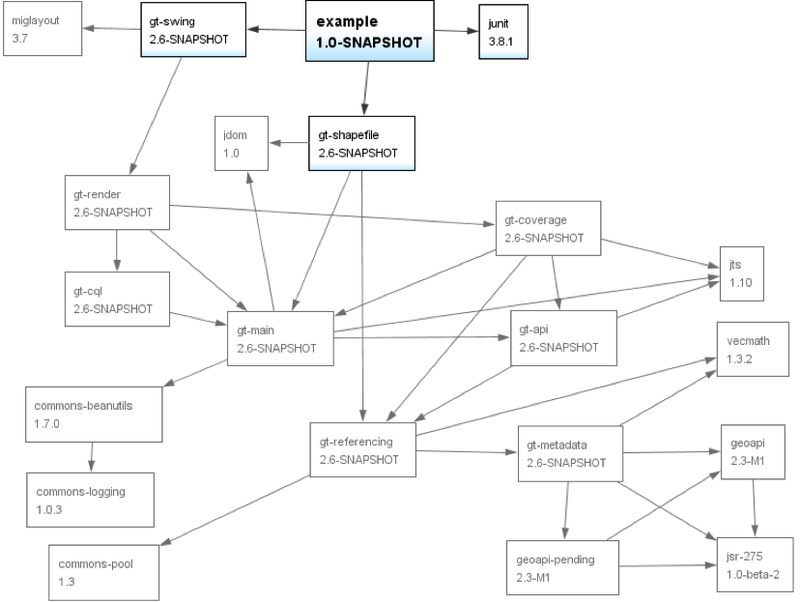 Important: GeoTools is an active open source project – you can quickly use maven to try out the latest nightly build by changing your pom.xml file to use a “SNAPSHOT” release. At the time of writing 22-SNAPSHOT is under active development. We will be making use of some of the project is greater depth in the remaining tutorials. Extract the geotools-2.6.0-bin.zip file to C:\java\geotools-2.6.0 folder. 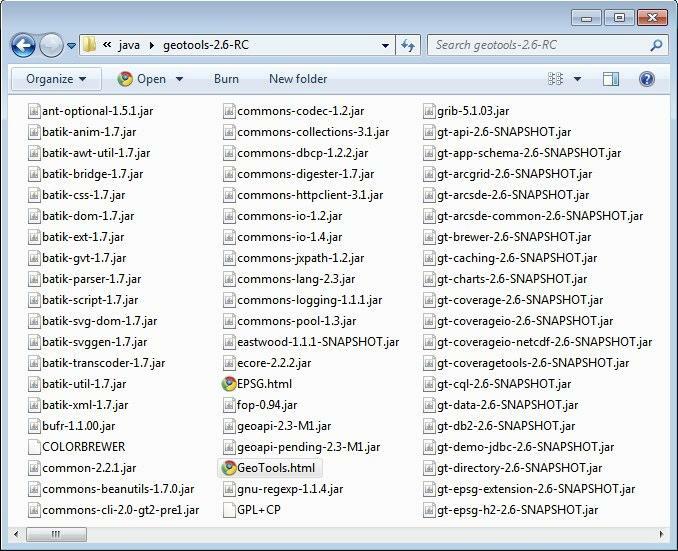 If you open up the folder and have a look you will see GeoTools and all of the other jars that it uses including those from other libraries such as GeoAPI and JTS. From the menu bar choose Tools > Libraries to open the Library Manager. From the Library Manager press the New Library button. The EPSG databaes is distributed as an Access database and has been converted into the pure java database HSQL for our use. GeoTools allows you to work with many different databases; however to make them work you will need to download jdbc drivers from the manufacturer. Fill in “Tutorial” as the project name; and our initial Main class will be called “Quickstart”. Open up Example in the Projects window, right click on Libraries and select Add Libraries. Choose GeoTools from the Add Library dialog.